So what do all these long lines about going out kidless have to do with Red Lentil Sweet Potato Soup? Absolutely nothing. I’m sorry but if you want my recipes you’re going to have to go through my blather about life….it’s all about balance. Give and take, lol! 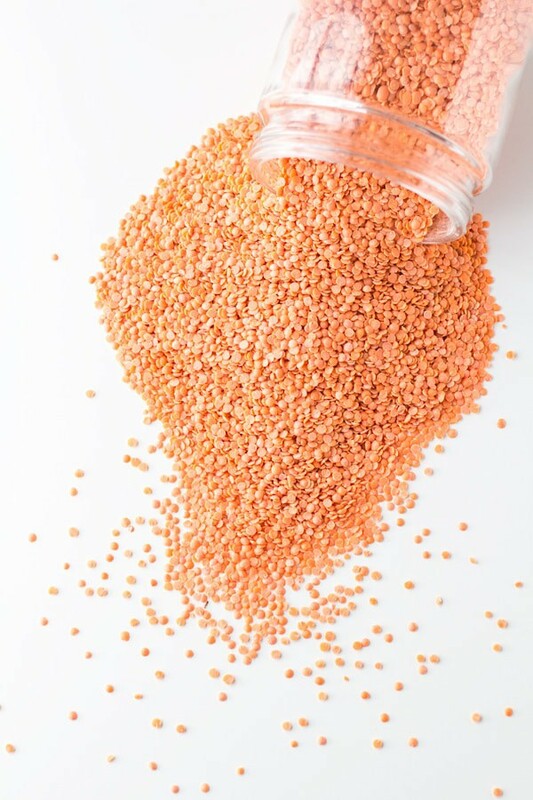 If you have been following Green Healthy Cooking for a while you might have noticed that I LOVE lentils. This sounds weird. Who loves lentils? People love chocolate, or maybe a piece of fruit, but lentils? I do love them though, seriously! Not only for their nutritional value and their price but for their amazing taste. Green lentils are my favorite and if I recall correctly I’ve only made recipes with those so far here on the blog. All lentils are equally delicious though and red lentils are awesome because they cook super fast and don’t require soaking. Perfect for last-minute lunches or dinners that have to be made quickly without missing out on nutrient-density. This soup hardly requires any seasoning. 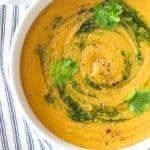 The red lentils and sweet potatoes have such an amazing flavour itself that the soup tastes pretty darn good even without seasoning and thus would be a fantastic baby food. It is nutritionally dense and has a naturally sweet taste. You can also easily freeze it. It can be served as a starter or main dish. We ate it as a main dish with some freshly homemade naan bread. I won’t bother you with the naan recipe though. It was meh :( Will have to work on that one some more to find the perfect recipe to share with you. Bring 6 cups of water to the boil. Peel sweet potato and cut into small cubes (about 1/2"/1cm). Peel onion, cut in half and add a toothpick to the onion to keep it from falling apart in the soup. The onion will be removed as one at the end. Add lentils, sweet potato cubes, half onion and crushed garlic, cumin and about 1 tsp salt to boiling water, cover and reduce heat to simmer. Simmer for approximately 30 minutes or until sweet potato is very soft. In the meantime, prepare coriander oil by picking a big hand full or coriander leaves and adding to blender together with olive oil. Blend well until all coriander is very small. Scraping might be necessary mid-through. 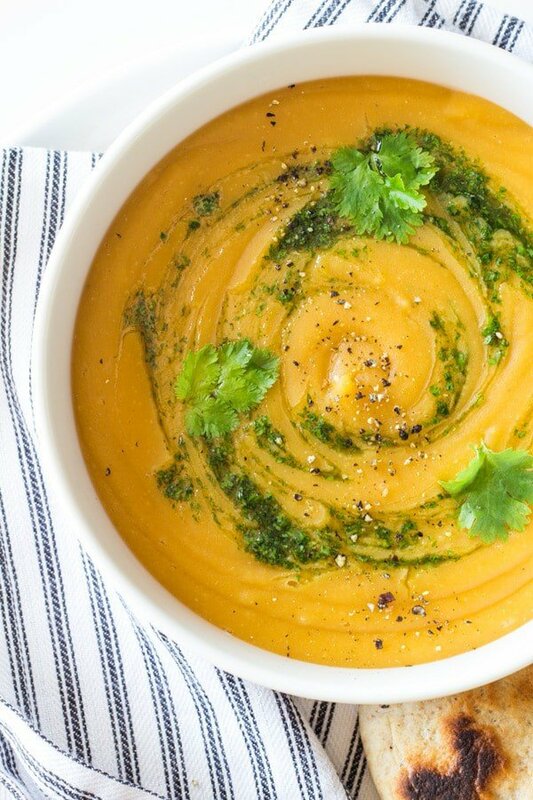 Once soup is cooked, remove half onion, blend remaining ingredients with an immersion blender or blender or food processor and season to taste with more salt and pepper. Serve in a bowl with a swirl of coriander oil and freshly ground pepper and fresh naan bread or bread of your choice. 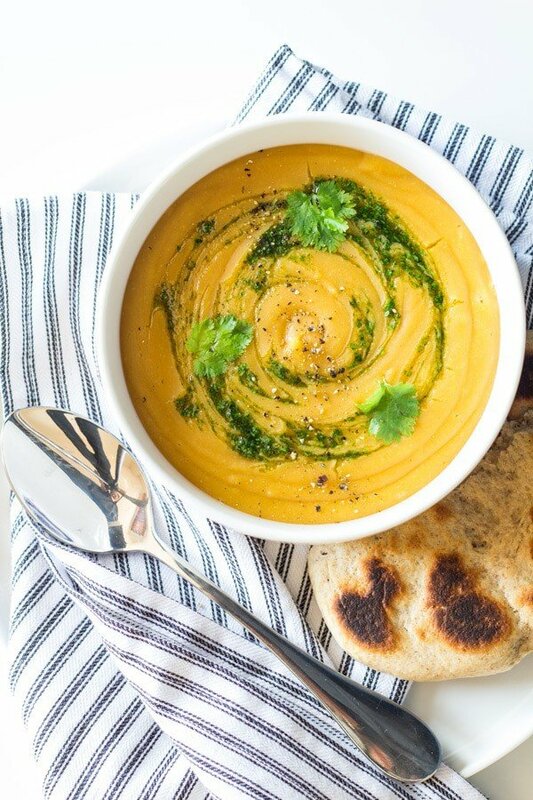 This soup is utterly delicious – I can’t get enough of it! I thought the consistency was just perfect. The only change I made was to add a little more garlic and also to throw in some fresh red chilli with the onions. Tasty! I’m sooo happy you like it that much Apenny!! love to adapt this to Instant pot, any ideas on where to start? Ok, so I did a quick google search of how long it takes to cook red lentils in the instant pot and it seems to be 10 minutes high pressure and natural pressure release. Considering very small sweet potatoes take only 15 minutes I would cut them up really small and then the 10 minutes should be enough. I’d do 10 minutes high pressure and natural pressure release until the pin drops. If the sweet potato isn’t cooked, immediately close the lid again and bring to pressure again and cook another 5 minutes on high pressure. Is it possible to use 3 cups of vegetable broth & 3 cups of water? Thank you so very very much! Super excited to try this! Delicious! I modified and also sauteed a whole onion two cloves garlic, a couple of stalks of celery, diced. I used 8 cups of veg broth and threee sweet potatoes diced. I added chopped spinich at serving time with a dollop of palin yogurt, sprinkle of lemon juice, and grilled nan bread. Great soup! – yummy and filling. I modified the recipe slightly by sautéing the onion and garlic in a little olive oil and then adding the rest of the ingredients. It’s a keeper. That is an excellent idea Chris! ? It was flavorful!!! My kids adored it despite the fact that they don’t care for lentils. The shade of the soup helps a great deal! This is such smart thought to put red lentils. Nice. Like the addition of coriander oil. I will use coconut oil rather than olive. Wondering, why remove the onion? Why not let it whirl together with everything else? It was delucious!!! My children loved it even though they do not like lentils. The colour of the soup helps a lot! This is such à good idea to put red lentils. Thank you Monika!! How nice of you to come back and comment. Thrilled! Lovely recipe. 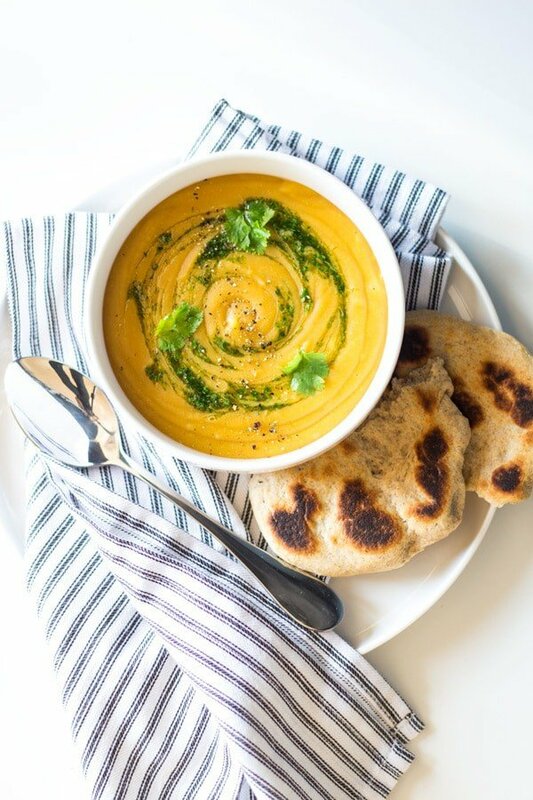 I am fond of both red lentils and sweet potatoes – a recipe that combines the two is a sure winner!